With the Conservatives at an all-time low in Atlantic Canada, the region's 32 seats are ripe for the opposition parties' picking. Calculations on CBC's interactive Poll Tracker incorporate the most recent published polls. Numbers quoted in the article below reflect calculations made when the article was written, and may not reflect the most recent polls. This is the first analysis in a series that will run until the end of the campaign, taking an in-depth look at where the polls stand in every region of the country and which seats are up for grabs. Atlantic Canada is not the largest prize in this election campaign, with only 32 seats at stake. And with the Liberal Party polling strongly in the region ever since Justin Trudeau became leader, there are only a few seats truly at play. But with the election promising to be one of the closest in Canadian history, those few seats could prove decisive. The Conservatives won Atlantic Canada in 2011 with 37.9 per cent of the vote and 14 seats, beating out the New Democrats, who won six seats with 29.5 per cent of the vote, and the Liberals, who took 12 seats with 29.3 per cent support. The Greens captured three per cent. It was one of the few regions of the country that still showed some Liberal strength. The party won just over a third of all its seats in Atlantic Canada. Four years later, the region is the only one in which the Liberals hold a substantial lead over their rivals. The CBC Poll Tracker, incorporating polls in the field to Sept. 14, gives the Liberals 47.9 per cent support in Atlantic Canada, a gain of almost 19 points since the 2011 vote. The New Democrats are in second place with 28.5 per cent support, virtually unchanged from the last election, while the Conservatives stand at 18.7 per cent. That represents a drop of just over 19 points for the Tories, suggesting that in this region of the country the Liberals have made almost all of their gains at the expense of Stephen Harper's Conservatives. The Greens stand at 4.4 per cent. The Liberals are down from the massive lead in the polls in 2014, when their next closest rival was 30 points behind. But the party is also rebounding from a recent low, when it was averaging less than 45 per cent support from the end of May through to earlier this month. Since Sept. 6, the party has been hovering between 45 and 50 per cent support. The New Democrats and Conservatives have seen less movement, with the NDP wobbling around 30 per cent support since June and the Conservatives around 20 per cent since the campaign began. Sub-regional polling suggests the Liberals hold comfortable leads in Nova Scotia, Newfoundland and Labrador, and Prince Edward Island, while New Brunswick is a closer three-way race between the parties. 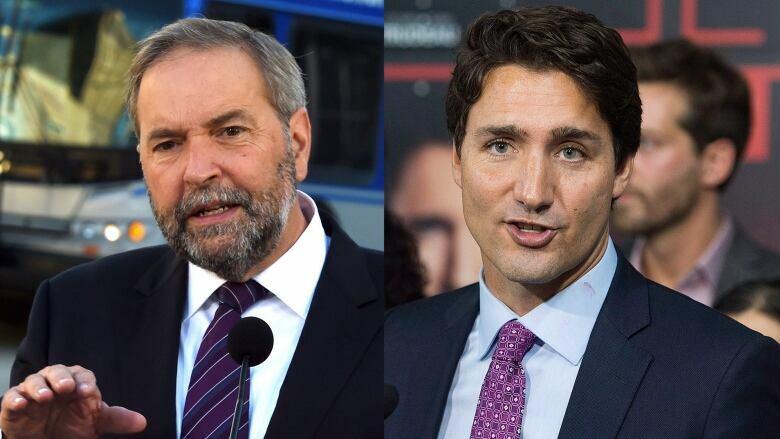 At a personal level, both Tom Mulcair and Justin Trudeau boast strong approval ratings in Atlantic Canada. Stephen Harper, on the other hand, has registered less than 20 per cent approval in most polls conducted in the region since the beginning of the campaign. The Liberals are projected to win the lion's share of seats in the region with their current levels of support, taking between 21 and 23 seats. The New Democrats are projected to win between five and eight, and the Conservatives between two and five. There is still plenty of time for the race to shift before election day, but Atlantic Canada has shown some of the most stable polling numbers anywhere in the country. The contest here is primarily between the Liberals and the New Democrats, at least in terms of how the region might swing. The Conservatives have not led in the region for over three years, and seem to have little chance of a rebound. A number of Conservative MPs, including Peter MacKay, are not seeking re-election, which doesn't help. Looking forward, the Liberals and New Democrats have good prospects for gains. The Liberals are projected to be in play in 27 of the 32 ridings in Atlantic Canada, while the New Democrats are in play in 14 ridings and the Conservatives in eight. At this stage, 17 ridings look safe for the Liberals and three for the NDP. The Conservatives do not look completely safe in any seat. Liberal chances are looking particularly good in the French-speaking parts of New Brunswick and in much of Nova Scotia, along with P.E.I. and Newfoundland and Labrador, where they already hold most of the seats. If their fortunes improve further, they could see gains at the expense of the NDP in Atlantic Canada's urban centres, and at the expense of the Conservatives in more rural areas. The following is a list of ridings that the Liberals could gain. Favourable gains are those in which there is a good chance of the party picking them up, potential gains are those in which the results may be close, and marginal gains are seats in which the party has an outside chance of winning. Potential gains for the New Democrats come entirely at the expense of the Conservatives in Nova Scotia and New Brunswick. If the NDP makes serious inroads in the region, it could encroach further on some of the rural ridings the Conservatives have won in the past. But the NDP is not only playing offence in the region, as seats in St. John's and Halifax could be at risk of swinging to the Liberals. With the Conservatives polling at one of their lowest levels of support in the party's history, Atlantic Canada is not a region where the Tories are expected to make any gains. If current trends hold, the Conservatives could be reduced to southern and western New Brunswick — if that. Atlantic Canada will be the first region to vote, and thus the first region where the votes will be counted. The region is unlikely to play a decisive role, but how the parties' results in Atlantic Canada stack up to expectations could provide some hints as to how the rest of the country will go as election night unfolds. CBC's Poll Tracker aggregates all publicly released polls, weighing them by sample size, date and the polling firm's accuracy record. Upper and lower ranges are based on how polls have performed in other recent elections. The seat projection model makes individual projections for all ridings in the country, based on regional shifts in support since the 2011 election and taking into account other factors such as incumbency. The projections are subject to the margins of error of the opinion polls included in the model, as well as the unpredictable nature of politics at the riding level. The polls included in the model vary in size, date and method, and have not been individually verified by the CBC. You can read the full methodology here.